At 71 years old, Ambrose Bierce began a tour of Civil War battlefields. Making his way through Louisiana and Texas, Bierce went further south into Mexico, a country then undergoing a revolution. He predicted he would visit Mexico as early as April, when he mentioned as much in a letter to friend H. L. Mencken (he noted "thank god, there is something doing [there]"). A veteran himself and a some time journalist, Bierce probably saw a good opportunity and followed the army of Pancho Villa as an observer. On December 26, 1913, Bierce wrote a letter to friend and journalist (and possible lover) Blanche Partington. 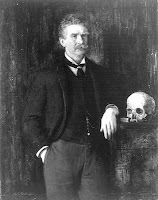 Her husband painted a portrait of Bierce, above, before his death in 1899. The letter closed with the words, "As to me, I leave here tomorrow for an unknown destination." Bierce was never heard from again. Speculation is rampant, fueled in part by Bierce's settling of personal affairs before leaving for his travels south, implying he knew of his impending death (suicide?). He may have been executed or killed in battle; some claim he was working as a spy the whole time. Many claimed to have found his grave. The Ambrose Bierce Appreciation Society has an article on the mystery here. Bierce's The Devil's Dictionary defines "kill": "To create a vacancy without nominating a successor." And, "epitaph" is defined as: "An inscription on a tomb, showing that virtues acquired by death have a retroactive effect."